Difficult people are everywhere in this world! It’s inevitable that you will come across someone regularly who’s hard to deal with. It could be a stranger at the grocery store, a neighbor, or even someone in your family. Regardless of where, you will have to deal with difficult people at some point in your life. An interaction with a difficult person could be a subtle mean comment, a loud angry outburst, or an ongoing stressful battle. Being around a difficult person may cause anxiety if you don’t know how to manage the situation in a healthy way. When dealing with a difficult person, you don’t have to take their abuse. Stand up for yourself. Refuse to argue and don’t react to their anger. Picture 2 people playing tug of war. If you are one of those people, you can let go of the rope and stop the interaction to disengage. It’s always ok to end a conversation if it’s emotionally abusive, getting out of control, or going in circles. Calmly let them know that you will continue to discuss the issue when he/she is calm and to let you know when they are ready to talk again. Then remove yourself from the conversation. Try to be direct and assertive in your communication and remain calm. Keep your confidence on the outside (even if you are shaking on the inside!) Make sure you stick to the facts and don’t talk about any assumptions or opinions. This will give you power when they get off track and overreact. The biggest power you have is when you keep your emotions in check and don’t give your emotional power to them. The moment you lose control is the moment they get control of you. I know a tense interaction with a difficult person will send many people’s anxiety through the roof. Remember to breathe and remind yourself that you can only control you. After the interaction, be sure to practice good self care. Here’s a few ideas for self care! It’s written for mom’s, but can apply to anyone. If these kind of interactions are common with this person, you may need to think through how much time you spend with them. If this is unavoidable, then you need to make a plan for how to communicate your needs in a healthy way and practice it- daily! Some difficult people may take out their personal struggles on you, so remember it’s not always as personal as it feels. The interaction will often tell you more about them and their issues- and it doesn’t really have anything to do with you. 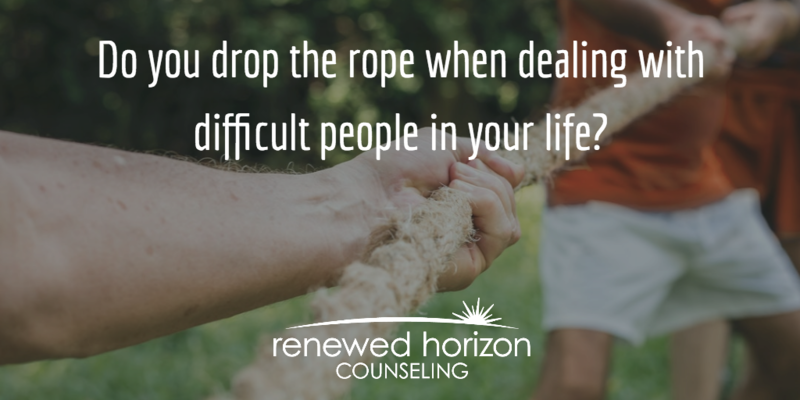 What are some other ways you’ve learned to “drop the rope” when you have to deal with difficult people?